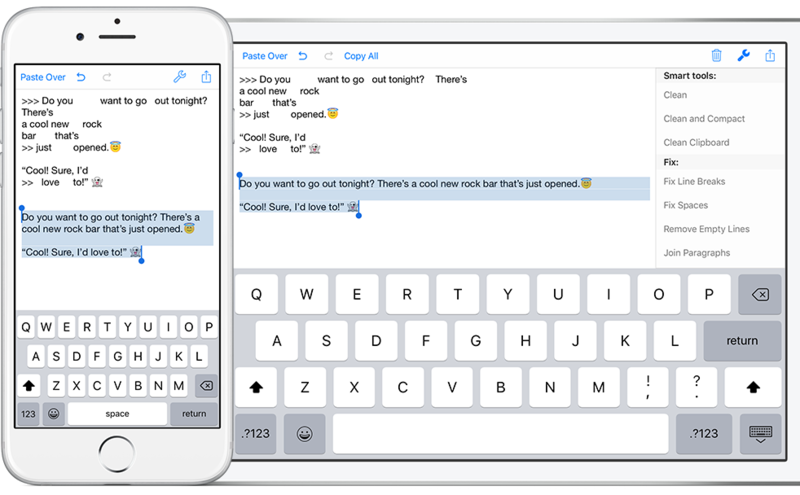 Apimac has announced the availability of Clean Text for iOS. 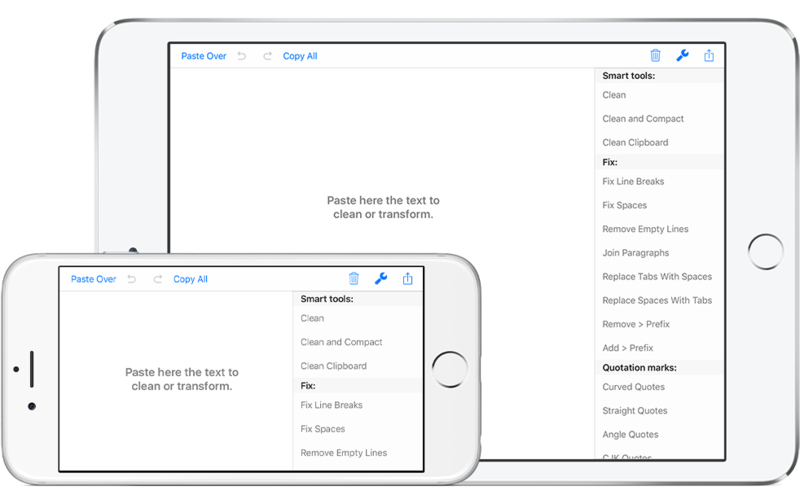 Clean Text is an essential tool for web masters, graphic designers, developers and magazine editors to reduce text cleanup and editing time, and a great tool for any iPhone and iPad user that needs to cleanup and editing text from emails, documents, or other material. Clean Text quickly performs many essential functions such as removing empty lines, removing unwanted spaces, converting tab characters, smart quotes, and more. Udine, Italy — March 21, 2016 — Apimac today introduced the new app Clean Text for iOS. Clean Text is an essential tool for web masters, graphic designers, developers and magazine editors to reduce text cleanup and editing time, and a great tool for any iPhone and iPad user that needs to cleanup and editing text from emails, documents, or other material. Clean Text quickly performs many essential functions such as removing empty lines, removing unwanted spaces, converting tab characters, smart quotes, and more. In addition to this, the “Clean“ and “Clean and Compact“ smart actions let you solve with a single tap, the most common cleaning problems of text from email messages, documents and web pages. With Clean Text, when you are working on a text and want to switch from one device to another, you don’t have to worry about anything, thanks to iCloud, you will find in the device that you just picked up, exactly the text that you have left on the device that you have placed on the desk. And with unlimited undoes, you can perform an unlimited number of undo operations. Clean Text supports live research: while you type in the search field all occurrences within the text will be highlighted to give you a complete picture, then with the Select Next and Select Previous buttons you can gradually select instances to edit or change them. Even the Find and Replace capabilities in Clean Text have something extra: the options Match Case and Whole Word, act immediately on the highlighted text and will allow you to do the replacements with millimetre accuracy. And if you are an expert, there is the powerful Regular Expression panel, which in addition to make available all RegEx capabilities for search and replace, it provides you the RegEx main patterns with a simple tap. • iPad multitasking Slide Over and Split View on iPad Pro. • Home screen quick actions on iPhone 6s and 6s Plus. • Physical keyboard shortcuts on iPad. • iCloud to access the same text from any device. • Smart Clean and Clean and Compact text. • Clean Clipboard content without the need to paste it in the app. • Replace tabs with spaces and replace spaces with tabs. • Remove and add email quote prefix. • Convert quotation marks: curved quotes, straight quotes, angle quotes and Chinese quotes. • Change case to sentence case, title case, uppercase, lovercase and random case. • Sort lines ascending and descending. • Convert from three periods to ellipsis and from ellipsis to three periods. • ROT13 encode (replaces a letter with the letter 13 letters after it in the alphabet). • Convert HTML to plain text. • Convert to upside down and to mirrored pseudo text. • Regular Expression search and substitution with live highlighting of matches and main patterns convenient buttons. Clean Text for iOS retails at a price of $3.99 USD (or equivalent in different currencies) and is available worldwide through the App Store in Productivity category. Apimac is a development company dedicated to create intuitive Mac and iOS apps. People at Apimac aim to put into users hands apps which they can use in a way they do things every day. Right after opening their apps, users can immediately focus on their task, not even noticing that they’re using an entirely new software. Apimac and the Apimac logo, Clean Text are registered trademarks of Apimac. Apple, the Apple logo, iOS and macOS are registered trademarks of Apple Computer in the U.S. and other countries. Other trademarks and registered trademarks may be the property of their respective owners.